Mariné Pérez, 30, resident of Brooklyn, New York, did not hesitate for a moment of assuming the responsibility of coordinating the Spanish translation edition of the newspaper Occupy Wall Street Journal, the work of the movement that caused the occupation of the financial district in New York in September 2011. 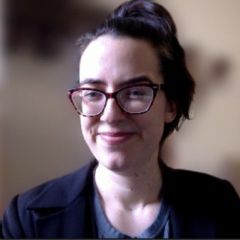 This Puerto Rican activist, with previous experience in the student struggles of the University of Puerto Rico and the University Sagrado Corazón, has been given the immense task of amplifying the voices of 99% through the effective use of pen and paper. 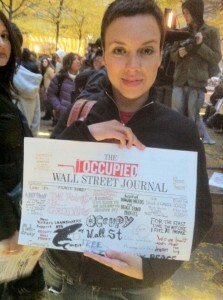 Photo of Mariné Pérez with the fourth edition of Occupy Wall Street Journal, taken by Chris Theokas. The following is an interview with the coordinator of the Occupy Wall Street Journal in Spanish (OWJS), that continues to be printed even after the removal of the protesters from Zuccotti Park on 15 November, 2011. 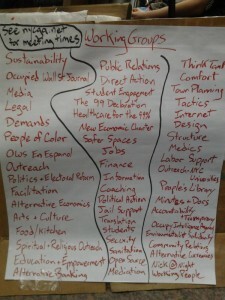 Global Voices (GV): How did you get involved with the Occupy Wall Street movement? Mariné Pérez (MP): Since I read the proposal, pitched by Adbusters I thought that I wanted to join the Occupy Wall Street movement. Finally I felt like they'd hit the nail on the head. And so, from the first day, 17 September 2011, I joined the protests together with a group of Puerto Ricans that live in New York City. Later on, I received another announcement that said they were looking for translators interested in supporting the movement. I sent my CV immediately to apply as a volunteer. Given my several years’ experience as a project administrator in a translation agency, and as a freelance translator, they invited me to coordinate the translations of Occupy Wall Street Journal [es] in Spanish. And I accepted. GV: When was the Spanish issue printed for the first time? MP: OWSJ in Spanish – like its English counterpart – began to be printed at the beginning of October. At this time we decided that the newspaper wouldn't be a “daily” paper which contains news, but something more like a space for reflections about the events that had taken place every week or two. GV: Who do you work with? MP: The (Spanish language) work-group is made up of about 25 members. 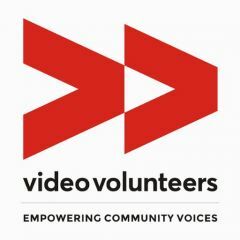 We're all volunteers. We don't just translate OWSJ, but we also subtitle the videos with the communications group, and we translate anouncements and other texts related to the movement. We also work very closely with the graphic designers, the printers and the distributors, and the editorial team. GV: How have both the Spanish and the English versions of the OWSJ been affected by the eviction from Zuccotti Park by the police on 15 November? MP: The eviction has affected neither the production nor the distribution of the newspaper. The writing and the translating are done remotely (people all over the world collaborate via the internet), and the newspapers continue to be distributed both to key places and to the OWS activities, where we know there will be a massive concentration of Spanish speakers. For example, it is distributed in the marches, the monthly protests to commemorate OWS, and the General Assemblies in Spanish, among others. On a personal level, the fact that there is no fixed occupation in Zuccotti Park has allowed me to have more time to manage this project, because before I visited the park everyday after my regular job, to then take charge of the OWSJ – I hardly slept! Now I have a little more time to dedicate to this project and help with the OWS work-group meetings, to which I belong. GV: Where is the OWSJ distributed? Where are those key places? MP: It is distributed in New York neighborhoods where we there is a Latino presence. It is also available in the Judson Memorial Church, Bretcht Forum and the universities of New York City and Long Island (CUNY). I want to emphasize the work carried out by Mariano Muñoz, one of the main people in charge of the distribution routes of the newspaper. 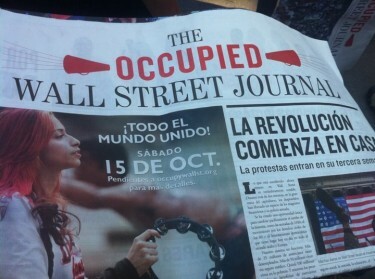 GV: How has the Occupy Wall Street Journal in Spanish been received? MP: So far it has been very positive. For example, OWSJ in Spanish was talked about a lot during the General Assemblies. 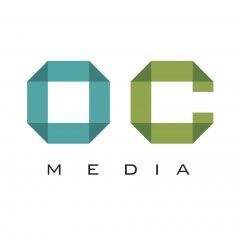 The idea of creating a new independent newspaper [with original content] was suggested, which will be written exclusively in Spanish. In this newspaper, we will cover news regarding the current situation for immigrants and Latinos in the country. It will also include a section dedicated to the actions of other “occupations” in the United States. In this way, we will continue to strengthen our links. We count on the support of the editorial team of Occupy Wall Street to carry out this pilot project. It is expected that 20,000 copies of the new newspaper in Spanish will be launched in January 2012. 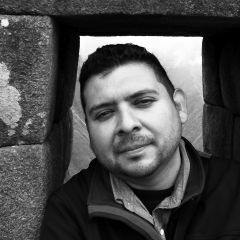 GV: What is the process for publishing articles in the OWSJ in both English and Spanish? MP: Articles, comments, questions, etc., must be sent to occupymedia@gmail.com. This address appears both on the last page of the printed edition and the newspaper's website. The deadline for sending articles to the OWSJ in English is decided by the editorial team. For translations, we normally give a week from the date that the editorial team from the OWSJ in English sends us the articles to translate. In general, when the printed English version goes out, we start the Spanish translations, and approximately a week later the Spanish newspaper is ready to go to print. GV: Can the newspaper be read in a digital format? 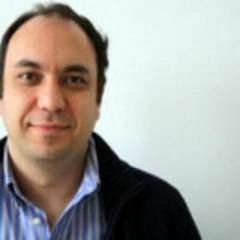 MP: Yes, the Spanish translation of the newspaper now has an active website and it is also available in French and Arabic. A page has also been created in Turkish. This initiative was carried out independently. There was no arrangement with an editorial team. 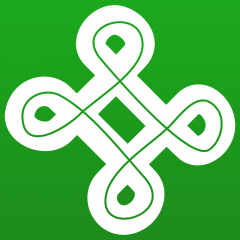 This is one more example of the decentralisation that we want to form. GV: What role has traditional media played covering the movement? MP: Traditional media waited for an explosive event to happen, like the massive arrests on the Brooklyn Bridge, to generate news. But I take its news with a pinch of salt because it focuses on trivial and sensationalist details. On the other hand, many people who only read the mainstream press have joined the movement thanks to its coverage. The movement is definitely on the minds of a lot of people. By the way, at this time a documentary is being made called While we Watch that discusses the role of alternative media in the Occupy Movement. It emphasizes, for example, the excellent work of the team focused on the media coverage of the movement. GV: Are there other newspapers published in Spanish about other “occupiers”? MP: I am not aware of other newspapers published in Spanish that focus on the Occupy movement but I would like to think that there are other projects in Spanish.